Mingjiang pursues excellence, actively improves production conditions, and have successfully introduced Toyota production management mode, and enhanced overall efficiency of company, relying on advanced production equipment and management tools. 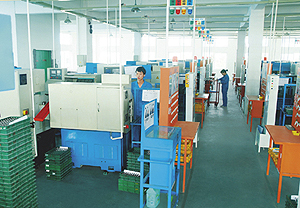 In order to improve the quality of our product, our company introduced Toyota Production System(TPS) in 2008. ①For training our employees in a real situation, we installed go-carts and slide way for rejects. “Abnormity Call System” was installed to help the management in abnormal situation. ③For insurance of quality in any period, we set random inspection station. 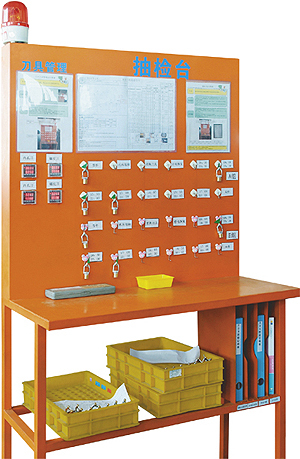 ④In order to visualize the process of the production and quality status in the job site ,we use production board. ⑤In order to abate rejects for the sake of the passivation, we use life span management tool.